The Buncombe County Tourism Development Authority should use its clout to change the way hotel room tax money is used in Buncombe County, a group of residents told the TDA Wednesday morning. A portion of the money should go to infrastructure improvements, such as roads, greenways and affordable housing, the speakers told tourism officials at the end of their monthly meeting in the Asheville Area Chamber of Commerce building on Montford Avenue. The five speakers made the same point: that Asheville’s booming tourism economy doesn’t not pay employees a living wage in the city, and that city infrastructure is suffering from over-use. Changes in the way cities are funded, made by the Republican-led North Carolina General Assembly, are adding to the pressure, the speakers added. The Buncombe TDA levies a 4 percent room tax, which it is required by law to use to promote tourism in Buncombe County, and for other “tourism-related expenses.” A proposed state law working its way through the N.C. General Assembly would increase the room tax by 2 percent. It’s the first proposed Buncombe hotel room tax increase in decades, driven by a hotel building boom in Asheville. There’s construction planned on a dozen new and expanded hotels in Buncombe County, according to the TDA, with about 1,600 new hotel rooms expected to open in the next two to three years. That’s a 20 percent increase. That increase could drive down the average hotel occupancy rates and the average daily room rate that hotels charge. “In 1983, it made sense to create a hotel tax and use it to promote the tourist trade,” said resident Heather Rayburn, who delivered the most eloquent and succinct address. “Afterwards, the industry boomed and brought many positives. But we’ve also seen many negatives as a direct result of your success – for example, higher municipal costs and an affordable housing shortage for your low-paid workers. so now the hotel tax needs to evolve to address the negatives,” she said. “What was good for the community in ’83 amounts to corporate welfare today. You call this a ‘self-imposed’ tax. It’s not. your customers are paying it. And as a distraction, you also beat the drum about the amount of property taxes you pay,” Rayburn said. The discussion regarding the proposed Buncombe hotel room tax increase and its use was done out of public view, Rayburn said. “You’ve deprived us of a well-earned, honest public deliberation and we’re mad. My taxes have gone up, partly due to your success, as well as the fact that Mr. Apodoca (N.C. State Sen. Tom Apodoca, R-Henderson County) is starving our municipalities of revenue and decreasing corporate income taxes. You’re winning all the way around. Your community is losing,” she said. “Your actions stand as a slap in the face of every voter in Buncombe County. Now, what are you going to do to make this right? We want you to rewind and rework this business, and we want to see a just and acceptable compromise – in writing,” she said. Buncombe TDA Chairman Bob Patel responded to the speakers, noting that the TDA had spent millions of dollars on amenities that touch “average citizens,” a group that he said his board cared about. In a related note regarding the Buncombe hotel room tax issue, Asheville City Councilman Jan Davis, also a member of the TDA board, chastised Buncombe County commissioners for failing to give the Asheville-Buncombe Sports Commission a $45,000 allocation in its newly approved budget. For the past several years, Buncombe commissioners and Asheville City Council have each given the Sports Commission $45,000 to fund its efforts to attract and stage events such as the Southern Conference basketball tournament, high school softball tournaments and collegiate wrestling and biking events. Davis said the cut by Buncombe commissioners was an 11th-hour move designed to force either the TDA or another entity to pick up the Sports Commission funding. If the hotels refuse to budge, I would abolish the Buncombe TDA. Use part of the 6% room tax to attract/fund development of high paying jobs which will more than compensate for any low-paying jobs in the tourism industry lost. Not only will locals earn more $ to spend at local businesses, but unlike the tourists now will pay taxes to fund infrastructure and the police. Tourists will always come here as long as the mountains and the Blue Ridge Parkway exists. Its about time we use it to our advantage. A lot of tourists come here to visit their retired parents anyways, so advertising the beer Pubcycle and other things are unnecessary. As Asheville grows (with retired baby boomers), reducing tourism may level traffic and compensate for it. I think that’s what part of this debate is about. Say we get rid of the TDA and as a result, tourism drops (which is different than going away; I agree with you that we will continue to have tourists regardless). If the tourism level drops, do we still have enough spending locally to ensure that the French Broad Chocolate Lounge is as successful as it is? Do we have enough spending locally to support the high number of restaurants in 28801, alone? I for one, am not certain we do. That likely leads to some (not all) business closings and lost jobs, and thus, lost income. And what are these “high paying jobs” you identify? How do we make sure we get them? Where do they go? What skill sets do they require? Does our population have those skill sets? If it’s that easy, why don’t we go ahead and bring those high paying jobs here now, and let all of these waiters and hotel employees off the financial hook? What infrastructure are they consuming? Gas tax pays for the roads, and a majority of roads in the city are state controlled/funded. These tourists are paying sales tax on the hotels they use and all of the food and merchandise they buy; and a big chunk of that money comes back to the City. Plus, they’re not around to consume services 365 days out of the year like many citizens are. Unless they actually call the police, are they consuming that service? But for that one tourist, wouldn’t the police still be there anyway? Is it fair to ascribe a policing cost to the tourist when the police already be employed? Lots of questions. It’s easy to bash the TDA with a big stick and forget their investments in City infrastructure, but cutting tourism promotions carries certain risks. The Buncombe RDS gives our $ to a New Orleans firm when (I think free) Romantic Asheville does a better job. What a waste of money. Spend the money locally. Yes, we do hire more police because of the tourists. About five give years ago I was a tourist and called the police to report a theft. Also, guess what? I gassed up in TN where gas is cheaper thus voiding the gas tax. I know the loopholes and this tax will close them. Just because you know the loopholes doesn’t mean everyone is exploiting them. I agree with you it would be better to spend the money locally, but it’s easy to say “bring better jobs” without knowing exactly what that means. If it was that easy, wouldn’t they be here by now? Although Ager is bought and sold, I support his project -Hickory Nut Gap Farm: Asheville’s Farm to Table Destination: Hickory Nut Gap Farm: $120,000. Along with the -Looking Glass Creamery: Urban Creamery Project: $331,846, these would have been mechanisms to create value-added industries which will replace any tourism jobs lost. Funding these type of projects and providing incentives for large companies that pay high wages to relocate here (as SC did with BMW) will continue and expand. The rest of the $ will fund infrastructure (roads, greenways), the police/emergency services, and possibly tourist/recreational venues which will benefit locals as well as tourists. Also, I would use part of the $ to relocate locals away from trailer parks (ban mobile homes). A cleaner ‘prettier’ city, of course, will attract more tourists. You may end up with more tourists after we are done. Why did Ager vote for it? Why did Turner and Fisher skip the vote? I don’t know. Haven’t asked them. I’m left with no choice but to think that you, Rich, Heather are in a small part of the minority, as Turner, Fisher, and Ager all voted for the this revision on the third reading along with with Sen. Apodaca. If this was as bad as you claim it is, I’ms sure those democrats would have voted differently. Good to know the folks in Raleigh have Asheville’s best interest at heart, isn’t it? Well, you’ve got it all figured out then. But without having talked to him myself, I would guess that John voted for this because half a loaf is better than none. There was never any chance that this legislature, especially Sen. Apodaca, was going to draft & pass something that Asheville City Council wanted, even if it was fair and rational and guaranteed to help the entire region economically. So, get the new revenue & then the discussion goes to TDA, in the hopes that they can be persuaded to spend some of that money on projects that both enhance the attractiveness of Asheville to tourists, and takes something off the City’s plate. Good to know the folks in Raleigh have Asheville’s best interest at heart, isn’t it? Anonymous snark at that. What are you afraid of? If what you are saying is true – about allowing the tax to go up and then taking a portion with it later – why is there an effort underfoot to try and have the County Commission block the implementation of the tax increase until the TDA capitulates (at least it was being discussed on a few Facebook pages as of Friday). Seems those folks in Raleigh with out best interest at heart would have donned some sort of protest in a similar fashion doesn’t it? Also, I haven’t seen anywhere that Reps. Ager (whose family may directly benefit from the distribution of the tax money) or Rep. Turner have indicated support for releasing the TDA money to Asheville, or more appropriately, Buncombe. I haven’t seen the faintest sign of protest from either of them. Without having seen any statement of the such, I’m afraid you’re just putting lipstick on a pig, Barry. You’re kinda good at misrepresenting things, aren’t you? Is that by accident or on purpose? Either way, it’s fun and easy to do that when you’re posting anonymously, isn’t it? I don’t know what people are discussing on Facebook. But if you re-read my post above, I suggested that what folks are thinking is not “releasing the TDA money to Asheville”, but persuading TDA to spend some of that new revenue on things that the City was planning to fund anyway – greenways for example. TDA has a lot of latitude on what constitutes “tourism-related expenses.” I could even see helping to create “workforce housing” for all those new low-wage workers to fall under that description. You’re really locked into this “identity” stuff aren’t you, Barry. Remember how huffy you get whenever Luther Blisset and NFB post here? 2) Lobbying the TDA to allocate its money towards local projects is a much more positive, and effective way, to go about this. 3) The TDA makes an effective and benevolent use of funds to assist Asheville in its growth, anyways. Why don’t you practice some of that local control you harp on so much, Barry, and leave Asheville issues to Asheville folks – you Woodfin voter. Well now you’ve drifted into outright lying. We don’t “agree” about those things, and you know it. Never mind. I think I know now why you hide. And peace be with you also, Barry. * Express a disdain for the elected leaders of the City that is the economic engine of WNC. When they deserve it, I’m one of the first to go after Asheville’s City Council. But on this one, I agree: the continuing evolution of Asheville as a tourism destination (and those who seek to profit off of it), shouldn’t be allowed to shove aside the valid concerns of the people who currently live here. Please don’t be so hard on yourself. It’s not that you’re misconstruing the facts, it’s that you’re totally ignoring them. Neither Reps. Turner nor Ager, that I have seen, have said anything critical of the TDA deal, Fisher wasn’t all that strong against it either; and all three House members voted for it. Using Ockham’s Razor here, representatives who do not criticize a proposal and wind up voting for it generally support the idea. You admit that you have not spoke to Ager about this at all, and presumably none of the others either. However, you have concocted this elaborate theory that they are against the TDA deal without any evidence, but supported it anyhow so that an intensive lobbying effort could be undertaken to get the money from the TDA at a later date. I’ve mentioned several times there is no thing to so much as imply that you are correct – but am willing to see evidence to the contrary. The point being, that if they did in fact support this, which matches their behavior, that means you, Gordon, Heather, and Rich Lee are in small, distinct minority. That’s what troubles you and why you can’t let this go. John Ager voted for this, and his family’s farm is one of the finalists in contention. Wow, so taxpayer money might be doled through a private entity and handed to someone related to the legislator that voted to give them this money. Yet, you have no problem with this and have not addressed it any way. Remember how you used to get mad that Moffitt would steal the water money? Now you don’t care that Ager may be voting for higher taxes that may wind up at his family’s farm. Not a good watchdog there, Barry. Asheville City Council has expanded its spending budget by roughly $20,000,000 per year over the last 3-5 years, but has only increased the Housing Trust Fund, for affordable housing from $400,000ish to $700,000ish. Really? That means that 1.5% of the $20,000,000 in new spending went towards the Housing Trust Fund, the primary weapon in making affordable housing. Some dedication, I’ll say. Yet now, select members of City Council have the audacity to call for the TDA money to be given to them for affordable housing? That’s just politically charged rhetoric that doesn’t match the actions of those calling for the change. Side Fact: Why does Asheville deserve the Buncombe hotel money – shouldn’t it go to Buncombe County? Why are you going after Asheville City Council? You vote in Woodfin. Practice what you preach: Local Control. Disdain? Really? You of all people are accosting others for treating elected officials with disdain? You may as well be Barry the Disdainer. In conclusion, Barry – if you’d like to address any of these fact patterns, I’ll be happy to continue this discussion with you. Your tactics of trying to win through ad hominem attacks and odd impeachments of character has grown dull and boring. Looking forward to constructive debate, Barry. I know it’s in you. No, debating anonymous troll spin is not worth the time. Life’s too short, Person-With-Something-To-Hide. Have a nice day. There’s that local control, Barry. Thanks for admitting you’re not a city resident and taking advantage of the lower taxes outside of the City of Asheville. You’ve raised another great reason as to why the TDA money shouldn’t be dedicated to Asheville City Council – it’s a county entity. It would be wrong, but not the first time, that the City asked the County to subsidize them. I’ll take your continued ad hominem attack to mean you’re not refuting the other facts I’ve set out for you. Anyhow, here’s a better summary of our debate that’s short and sweet: http://ow.ly/P0pMQ. First, with the vote. (HB 347, 3rd Edition). Rayburn said herself that they voted in a delegation friendly to Buncombe – so she might want to ask why Ager voted for this while Fisher and Turner skipped the vote. Are they no longer friendly to Buncombe, or do they really have Buncombe’s best interest at heart. We’ll move onto with Barry, he’s usually the most fun. Aside from single handily deciding what comments are legitimate and which ones aren’t, Barry’s missing a key point. In the AC-T story on this issue some number of days ago, Chamber-Leader Kit Crammer said that Asheville is frequently on these Top-10 lists because of promotions carried about by the Chambers and others. So when Patel asks what Asheville may look like without Tourism, that question is not unfounded. Will all tourism go away? Obviously not. Would there be enough tourism to sustain the 100+ restaurants in the 28801 zip code and the jobs those carry? Perhaps not. Will those lost restaurant jobs be replaced automatically with high tech paying jobs? Clearly not. Also, none of the TDA detractors seem to be mentioning the fact that hotels collect sales tax – about 80% of which is remitted to the City based on the Mayor’s 88.1 interview yesterday. (Yeah, yeah, the money’s not gone to Madison County yet). Lastly, Rep. Turner said himself that we have to ask the question – does a average tourist have a negative or positive economic effect on the area? I’d argue that a family of four who visits the Biltmore House, eats at Rhubarb and Curate, while shopping in the RAD has a positive economic effect on the area. That’s income that goes directly to local business owners – not to mention the sales tax collected at those other locations too. The people who seem to be the maddest are the ones on City Council who managed to increase City spending by nearly $30 million over the last 3-5 years, but left the Affordable Housing Trust fund hovering around $700,000. So when Patel asks what Asheville may look like without Tourism, that question is not unfounded. It so obviously IS unfounded. Nobody involved in this debate has suggested that tourism should simply stop, and nothing that has been proposed would cause that. That’s crazy. So why does TDA, or you, suggest that if TDA spent a portion of the New occupancy tax revenue on infrastructure, that it would lead to the death or serious diminishment of the tourism industry? It’s false and wildly unfair to people who are trying to have an honest discussion. Anyway, that’s after the State takes their cut. Once 80% of the remainder gets sent back to Buncombe County, they take a huge cut, and then re-distribute the remainder among the various Buncombe municipalities. Half of them (Montreat, Biltmore Forest, Woodfin) get way more back than they generated. So no, the City of Asheville does not get 80% of the sales tax generated here. It’s waaaaaaaaay less than that. This chart from urban planner Joe Minicozzi shows that in 2010, Asheville businesses generated around $120 million of the $130 million total for Buncombe sales taxes – but only got back $14 million. As more of the region’s economic activity moves towards tourism, it’s not unreasonable to ask that the people profiting from it make decisions that ensure that the City it is based in remains healthy and inviting. According to Esther’s testimony at the NC House Finance Committee this morning, after that process that I described above, the City of Asheville only gets 4.3 cents out of every dollar of sales tax generated in Asheville. That’s lower than it was in 2010, and the NCGA is gearing up to take even more of that away. Would there be enough tourism to sustain the 100+ restaurants in the 28801 zip code and the jobs those carry? That’s a silly handwavy question. We know the first-year failure rate for restaurants. Lots of people set up restaurants for bad reasons, lots of restaurants fail. That’s beside the point, when the question ought to be why Asheville has incredibly overqualified restaurant workers. I’d argue that a family of four who visits the Biltmore House, eats at Rhubarb and Curate, while shopping in the RAD has a positive economic effect on the area. Who is this family, exactly? But more to the point, you do know that Biltmore employees call their workplace ‘The Plantation’, yes? The argument has always been whether tourism (and the TDA) provides ever so much spackle on a city economy with very large holes, and that you can only spackle something that’s structurally unsound for so long. I can’t argue on what you hear some people say – it could be 25 out of many, or it could be a great many more. I also know some folks who work out at Biltmore and seem immensely happy with their jobs. So there. Hearsay vs. hearsay. Back to the first point – I’m not talking about first year failure rates, I’m talking about the number of restaurants as a whole. It’s one thing if first years go down, but I think the tourists have a lot to do with keeping everything open. I don’t know that Asheville has the population to keep open every restaurant downtown from the Lobster Trap to Ben’s to Korea House and all the others in between. Your question is a valid one though – why does Asheville have so many highly educated under-employed folks? I don’t think poli-sci 101 raid on the TDA money will solve that issue though. Another better question is: why is it the same City Council that raised Asheville’s budget by over $20 million in the last 3-5 years, but left the Housing Trust Fund hovering around $700,000, now claiming they need the TDA for affordable housing? Seems like misplaced priorities for me. Really? Asking them to spend a little of the tax money on infrastructure needs, equals trying to abolish the entire tourism industry? Is that how they handle citizen input over at the TDA, grotesquely misrepresenting people’s concerns? While hotels are already paying city taxes, the main difference between them and most other businesses is that their guests are not locals. Theirs customers should pay an extra tax more for policing and using the city roads. Even for state roads, most through drivers will stop for gas in TN or SC where it is less expensive so bypassing the highway tax. I thought the ‘war on Asheville’ was over. Is Mouthpiece really claiming that the sales tax reallocation scheme isn’t a broad-based attack on small and mid-sized municipalities to benefit folks in unincorporated county areas — alongside the NC Leg’s tax policy which punishes small and mid-sized businesses to favor large corporations? Is that officially Shady McGrady’s position, or is this just Mouthpiece in his spare time? I suspect he’s doing this on spec, hoping to get picked up – unfortunately, I think everyone with any political sense realized he did more harm than good to his last employer. In any case, anyone who says the war on Asheville is over didn’t attend the City’s legislation delegation breakfast in December. Chuck McGrady made it clear he will be picking up the shillelagh now that Tim and Nathan and gone. 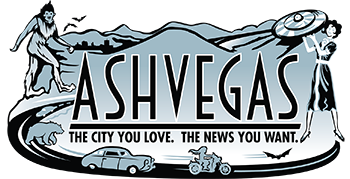 For years whenever it was suggested that a portion of the room tax should go help to pay for the services tourists use the TDA claimed that any raise in the room tax would result in tourists not coming to Asheville, but going elsewhere. Now that the hotel building boom could dilute the number of guests local hotels have they want to raise the tax and suddenly such a raise won’t cause tourists to go elsewhere. Government should not be collectinh a tax on any goods or services for the purposes of a single industry, especially when that money goes to an organization (the TDA) that is not accountable to the public. Of course there are too many hands in this particular cookie jar for any changes to be made. That’s right. Hotel owners should give some of theirs proceeds to the Chamber for tourism development if that’s what they want. Also, I doubt that $90K makes much difference as to whether the Southern Conference (among other sports entities) wants to hold its tournament here. Maybe Mr. Davis should ask the state to allow a special tax on tickets to all sporting events to fund to fund the local sports authority to promote sporting events. After all, isn’t that what we do with tourists? Also, I doubt that $90K makes much difference as to whether the Southern Conference (among other sports entities) wants to hold its tournament here. Maybe Mr. Davis should ask the state to allow a special tax on tickets to all sporting events to fund the local sports authority to promote sporting events. After all, isn’t that what we do with tourists? Exactly. As Chris D. says, if the hotel owners want to divert room fees into a slush fund for tourist attractions, that should be entirely their own concern, and nothing to do with the state legislature, given that the distribution is in the hands of an unaccountable board. It’s not a damn tax. The UNCA Board of Trustees, as well as the AB-Tech Board of Trustees are unelected boards that get to spend taxpayer money. We should disband those as well, right?